The New Life Church "Helping Hands" ministry was back in action again last Saturday. Jeff Brophy, Jon Van Tuyl, Josh Whitbeck, Ronn Pricer, and Lee Bennett helped Andy and Aaronn Doyle with a much needed project. 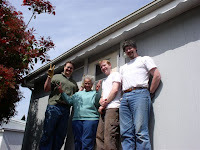 In the space of about 3 hours this motley crew tore off a back porch and built another one in its place. Lee Bennett says, "the ministry of Helping Hands is simply to give men in our church who have strong backs and willing hearts an opportunity to help people in our church and do outreach to our community." Lee has a list of about 25 guys who are willing and able to do all sorts of odd jobs to help people who are in need. He says the only reason this ministry isn't more active is that the team simply isn' t made aware of the needs. If you are aware of a need in our church or in the community that this team could help with, please contact Lee Bennett at leenlou5969@msn.com.